This photo was taken a few years back at the Clark Museum in Williamstown, Massachusetts. I’ve always enjoyed the expression of delight as this lady receives my origami hen after I folded it in front of her. A magical origami moment! 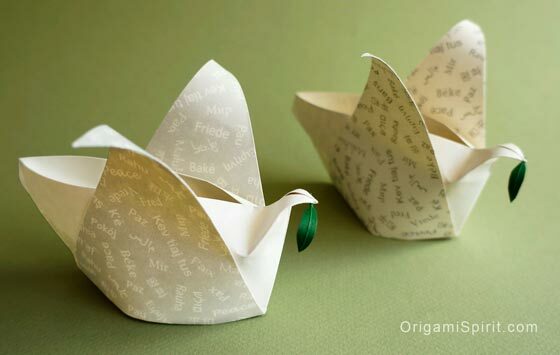 I love origami because it is a vehicle for creativity, inspiration, joy and peace. The United Nations has declared September 21 as a day devoted to strengthening the ideals of peace, both within and among all nations and peoples. I invite you to fold something today in celebration of the International Day of Peace and this ideal. You might want to fold the hen in the photo above or this peace dove with a special paper designed to make it. You can download the paper for free. To see many other options to fold this day, including the peace crane, you can visit my listing of all the origami tutorials published in this website. What a wonderful picture — and moment! I grew up in Williamstown and spent many hours at The Clark (in high school, I used to skip school to spend the day there! ), so this photo is a lovely reminder of my youth. Thank you! Nice memory, Sarah! I wish I could have skipped classes in high school to spend my time in the Clark. What a great photo, Leyla; and I am assuming John was behind the lens? I too know these very magical moments when you give to someone an origami treasure and they, like the lady in the photo, treat it as if it were Ming China :-) And to me it is indeed much more valuable! Hi Rosemary. Yes it was John at the camera… One of the things that made this event special is that people got to see the folding process in front of their eyes. They loved it!